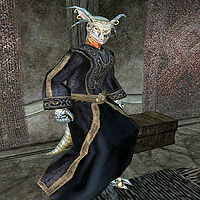 Only-He-Stands-There is an Argonian healer who sells potions and spells from Balmora's South Wall Cornerclub. It seems he has also been offering magical training, and since he is not a member of the Mages Guild, Ranis Athrys will ask you to stop him from doing so. Once you have completed the Unsanctioned Training quest, he will offer you his services, including Spells, ingredients, potions, and medium training in Mysticism, Alteration, and Restoration. "What? I don't offer any services. Who told you that?" "Report back to Ranis Athrys and remember our agreement." Caius Cosades: "I don't know what your business with him is, but be careful. Caius Cosades may appear to be a pathetic old man, but don't judge by appearances. Some people made that mistake a while ago, and now they're not with us anymore." latest rumors: "Tsiya has a little bit of a "sweet tooth," if you know what I mean. I heard her connection hasn't arrived yet, though, and she's been acting a bit jumpy." "Look at these people, %PCName. They cannot afford the services of the Mages Guild. Is it wrong to make their lives easier? Perhaps you can convince me." [Disposition ≥ 40.] "What if, hypothetically, you were to return to Ranis Athrys and tell her that I agreed to stop any unsanctioned training... And suppose that if you did that, I decided to offer training to my good friend %PCName?" Yes, I agree. "Very well. I will offer you training after you've reported back to Ranis Athrys." No, you must stop offering training. "Then you have your orders. You know what you must do. I am prepared to die." [Disposition ≥ 50.] "Please reconsider, %PCName. I believe I am offering a vital service to these people. But I [sic] perhaps you can still convince me." [Disposition ≥ 60.] "Very well. I shall stop offering training. Tell Ranis Athrys that I will not interfere with her... authority any more." "I will stop training others in Restoration." "You told me not to offer training. I have not." "Do you want training, %PCName?"